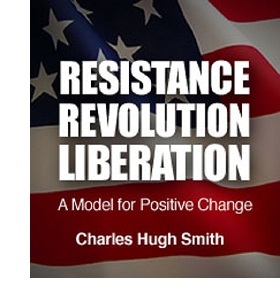 oftwominds-Charles Hugh Smith: Cui Bono Fed: Who Benefits from the Federal Reserve? 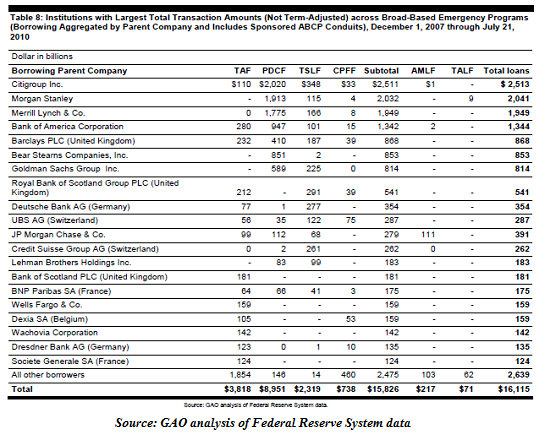 Cui Bono Fed: Who Benefits from the Federal Reserve? Does the Federal Reserve benefit the nation, or just the banks? Who benefits from the Fed's existence and its policies of loaning "free money" to banks at 0% and ZIRP (zero interest rate policy)? The Status Quo's answer is "the American people," of course, a deliciously juicy layer of "Big Lie" propaganda and obfuscation. Recall that the entire gross domestic product (GDP) of the U.S. is around $15 trillion, and all residential mortgages in the U.S. total about $10 trillion. The Federal Reserve System has both private and public components, and was designed to serve the interests of both the general public and private bankers. The result is a structure that is considered unique among central banks. Progressive Democrats favored a reserve system owned and operated by the government; they believed that public ownership of the central bank would end Wall Street's control of the American currency supply. Needless to say, the Progressives didn't get a government-owned central bank. Silly Progressives! That would have inhibited the Fed's only real purpose, which is consolidating wealth and power in the banks. The stated purpose of the Fed is to "even out" the business cycle by never ever allowing "bank panics," in which banks failed because they were over-leveraged and burdened with bets that soured. This has been sold as a policy of avoiding recessions and turning those few that slip through the cracks into short, shallow affairs with no lasting consequence. Banks fail when credit has been over-extended and minimal collateral has been overleveraged. In the old days, depositors were wiped out along with the bank's owners and managers. But the FDIC deposit insurance eliminuated the threat of depositors being wiped out when banks failed, and this did not require a central bank. It certainly doesn't appear that a central bank helps maintain competition in the banking sector. What is the fundamental basis of bank wealth and power? The financialization of the entire economy. And what are the primary mechanisms of financialization? Ever-expanding credit (debt) and leverage based on phantom collateral in phantom assets. And what is the primary purpose of the Fed's policies? To expand debt and leverage. These are the essential mechanisms of increasing the banking sector's wealth, power and control over the economy and the machinery of governance. Expand debt and leverage and you expand banking profits and thus the banks' political power. As noted yesterday in The Federal Reserve's Cargo Cult Magic: Housing Will Lift the Economy (Again), the interest on skyrocketing debt drains income and capital from potentially productive investments to pay for unproductive debt-based spending on consumption, fraud, friction and malinvestments. "Free money" loans create moral hazard, which means that those who can borrow money for almost nothing and never have to pay it back act entirely differently from those paying market rates for money and backing their loan with real collateral that is at risk. Banks borrow from the Fed at 0%, students borrow from the banks at 7%. Banks never have to actually pay back their "free money" from the Fed, while students are indentured for life to the banks. Widely distributed prosperity for the citizenry results from increases in real income that flow from productive investments and higher productivity that's passed on to workers. The Fed's model of "prosperity" is to enrich the banks and incentivize workers to take on more debt to boost their consumption and their purchase of phantom assets in stock bubbles, housing bubbles, etc. The banking sector's solvency is entirely dependent on officially sanctioned over-valuation of phantom assets. How do you keep phantom assets inflated? You allow banks to mark assets to fantasy rather than market, you keep interest rates at zero to encourage marginally qualified borrowers to take on more debt than is prudent, turning the borrowers into debt-serfs, and you buy dodgy debt (such as impaired mortgages) from the banks to clear the bed debt from their books. And of course the one thing you never do is loan money directly to citizens or buy their dodgy mortgages. That wouldn't serve the banks. These are all the policies of the Federal Reserve. Let's return to our original question: who benefit from the existence of the Fed and its policies? Answer: the banking sector. The financial sector ran wild in the 2000s, running on a model of systemic fraud and "the Fed's got our back" speculation. 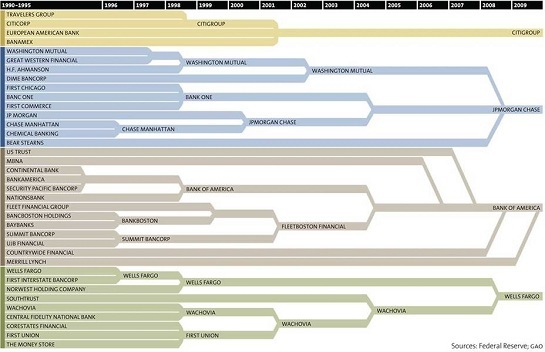 This frenzy of financialization ended when the pyramid of instability and over-reach imploded. Any healthy political and financial system would have broken the fraud-based system and dismantled the failed banks en masse in an orderly fashion. One institution stopped this from happening: the Federal Reserve. Instead of allowing a failed system to collapse and establish a new one based on prudent lending, market-set interest rates, competitive banks and transparent regulatory structure, instead we have a failed system that has become even more politically powerful even as its Fed-backed excesses have increased systemic fragility. The Fed exists to serve the banks. Everything else is propaganda. Ever-expanding debt leaves America a nation of wealthy banks and increasingly impoverished debt-serfs. Cui bono, baby. Thank you, David K. ($50), for your stupendously generous contribution to this site-- I am greatly honored by your steadfast support and readership.